While reading a Pratchett I usually feel that I’m part of a group of people enjoying an in-joke. In the case of this book however, I constantly felt I was missing the joke. At the start of the read I kept waiting for something to happen. While I got a lovely insight into how the Assassins’ Guild is run and conducts its final examination, I was left rather baffled as to where all this was leading. The first 250 pages seem steeped in great sadness. I could not shake this feeling, especially when reading sections about High Priest Dios as he desperately clings on to power through the manipulation of time and aging. I came away from the remainder of the hero’s wanderings through the desert and other dimensions parched and in desperate need of a waterhole. I struggled to finish this one. Overall I was left feeling hollow, like one of those doughnuts with the hole in the middle. So I’m very glad I’ve got Guards! Guards! to move on to as I’ve been told it’s epic. 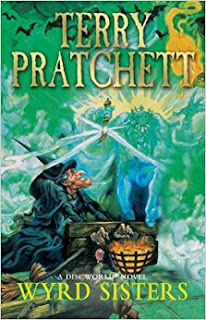 The murder of the King of Lancre is the opening for this Pratchett offering and sets the scene for the tyranny and intrigue to follow. Pratchett playfully refigures the plot of Macbeth to give us the story of how a country ruled by a tyrant chooses to rebel. It’s not pretty, with the usual majority blaming whomever the ‘media’ decides is to blame. And for this particular scenario, the witches come under the cosh. Naturally the witches are forced to fight back in the manner which only a Pratchett creation can. As usual, he is able to highlight the flaws in society and how people turn on each other at the slightest provocation. The book also focuses on feelings of frustration due to powerlessness in a given situation. How well I know that particular emotion. I grew up listening to Rock & Roll, Soul and Rhythm & Blues with a hefty dose of Disco and Easy Listening thrown in for good measure. Saturday and Sunday afternoons our house was often full of the strains of Elvis, Nat King Cole, The Blue Notes etc. Every once in a while furniture was pushed against the wall and we danced. I never sang. My dad was the singer, with a voice to equal that of a choir of angels. My mother sang off key and so did I. Many years ago I was told I’m tone deaf. This put me off singing completely, unless of course I’m totally alone, singing in the car or in the bath. I’m an occasional hummer and a mouther of words but no actual sound makes it out from between my lips. 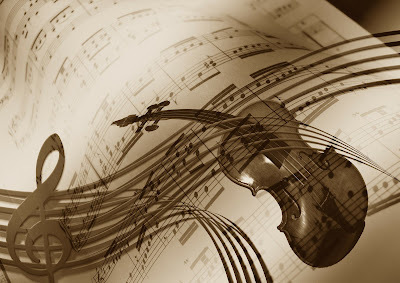 So I grew up with the firm belief music, for me, was restricted to one thing and one thing only – DANCING. 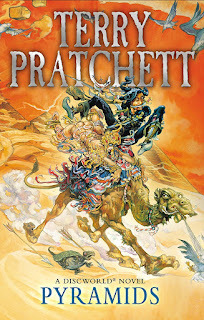 You may remember that earlier this year I decided on the insane challenge to read every single Pratchett ever written. To ease myself into the task I’ve started with the Disc World series and am currently on book 6. That obviously means I’ve finished book 5 so here’s my review of it. 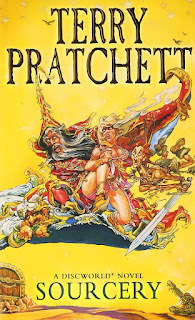 This latest Terry Pratchett instalment finds us back with the hopeless wizard Rincewind. And of course, The Luggage makes a welcome return too. I confess I’m very fond of this particular travel accessory in the Disc World series and am always keen to know where it will shift its loyalty to next. I was not disappointed as it fell in love with the delectable Conina and then suffered greatly when she spurned it. The plot revolves around the fact that the 8th son of a wizard is in fact a sourcerer. A particular wizard, not keen to submit to the rules of Death, decides to use the fact he has an 8th son to his advantage. And so the mayhem ensues.